Just cobbled together a promotional video for my upcoming ebook, It Girl! What? The K-Drama Gender Bender Adventure Comedy, Super Fun! Yes! Check it out, and please Like and Share! I will make your dreams come true! Sort of. What I mean is that for a limited time, I will take commissions, writing up a story to your specifications! This would need to be a YA story, and include no illegal content. Why am I open to commissions? Because I just finished a massive revision of the book formerly released as Brain Biters. This is one of those cases where I put the book out too fast. I was so excited by the characters and the story that I just launched it into the world and said– this is done enough! But it wasn’t done enough. The middle of the cake was still raw, and the more I thought about it the more I realized that I had betrayed the characters and not fully told their story, especially that of my main character, Dylan, who finds his world turned upside down thanks to an casual wish upon a star. So, I began cutting and adding, finessing and developing until I turned what had been a sleek 45,000 words story into a still sleep 60,000 word story, and now i feel my characters really get to speak and truly reveal themselves to the world. It will be out soon, and then in a few weeks I begin to write the sequel to Brother Bewitched. In the meantime, if you ever wanted a story written, I charge 5 cents per word, plus I sell the story on Amazon. If you are interested, contact me at tgkadee@gmail.com! Oh, my, this book did make me cry. A good cry, and so that alone earns it five stars. I know. Big surprise. 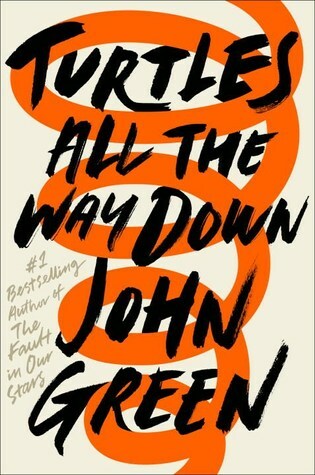 A John Green book is good. Not news. A great first person narrator. Aza is smart, too smart, and her intelligence causes her to ask a lot of questions about life, identity, self, relationships. She also has issues, and ones that make her very difficult to friend. I identified with this character, and reading her story reminded me of so much I had forgotten about myself that it was like finding an old box of pictures and seeing images of me from the past and thinking– wow, that used to be me, and then, that still kind of is me. I went to a holiday party just a day ago as of this writing, and I sat down at a table with a group of people, and I couldn’t have felt more like an alien. They were all having fun, talking about nothing, just babbling, and I couldn’t enter the conversation. I have no small talk game at all. It’s not something good or bad, but my mind was full of the books I was reading, books I was writing, and I wanted to ask people about them, about their work and their dreams and their lives, and when I did they just looked at me like I was the biggest weirdo in the world. So, yeah, I get Ava. As in many of these books, we have missing adults. Aza and her romantic interest have both lost parents. And it has a mystery in the form of another parent who had vanished. But those are all just McGuffins. What this book really explores and what hooked me is a very earnest and well bred human being searching for answers, trying to understand who she is and why and how to get through the day without freaking out. It’s a glorious, messy and inspiring. I’ll leave others to complain about this or that or the other. I fell in love with the characters and their struggles to just find a way to be people, and I recommend this book to anyone who has ever stopped to wonder. I am asking the questions today. You know, THE questions? Who am I as a writer? What am I? And, if i can’t figure that out, how am i ever supposed to target the right agent? I wonder if I am really a YA author. Sometimes, when I look at the books that have come out of me so far, Brother Bewitched and Brain Biters, I shake my head and think– I don’t know that any teens would want to read this stuff. In both books my characters are teens, and the stories are told through their eyes. I am not some adult lecturing them about their lives, or pounding them with cliches they are old enough to know are just things adults say to hide their lack of real wisdom. But maybe my books are too cold? The characters not passionate enough? Maybe I am dealing with things in a way that is alien or foreign to younger readers? Maybe I am just too weird for any normal teen to relate to? I have to confess, I did not read a lot of the books aimed at YA readers when I was of the age. I wanted to be older and more serious, and so instead of reading Robert Cormier I read Stephen King. Now, I later read Robert Cormier, and I felt like I had really missed the boat not reading him earlier, but even as a YA kid I didn’t think I was a YA kid. So, maybe my books will never sell well to YA readers (or anyone else). You know what? I am going to keep writing anyway. When I published my first book many years ago, (not YA and under a different pen name) I told myself I would be happy if one person read it and related. It ended up selling about 300 copies, and I waited anxiously day after day, hoping one of those readers would submit a review. Surely, one of them would be my reader, the one I imagined would read the book and know he or she wasn’t alone. Someone else felt and thought the same things! Well, that very first review came, an d it was terrible. The person HATED my book, and they hated it so much they felt compelled to tell the WHOLE WORLD how much they hated it. I felt destroyed, and for several days I moped around, thinking I would never write again. Then, something amazing happened: a second reviewer posted a review directly refuting the first, defending my little book and praising it. I can’t tell you how great it felt, because this was my one reader, and not only had they related, but had related so strongly they felt angry when someone attacked our book. Since then, I have gotten good and bad reviews, and weird reviews that made no sense. And as I reach the end of the essay, I realize that I still don’t know what kind of writer I am, or if my books are “really” YA books, as in really, really YA books. But it doesn’t matter. I write and write, and someone out there gets enjoyment from my work, and feels less alone, and so I do, too!